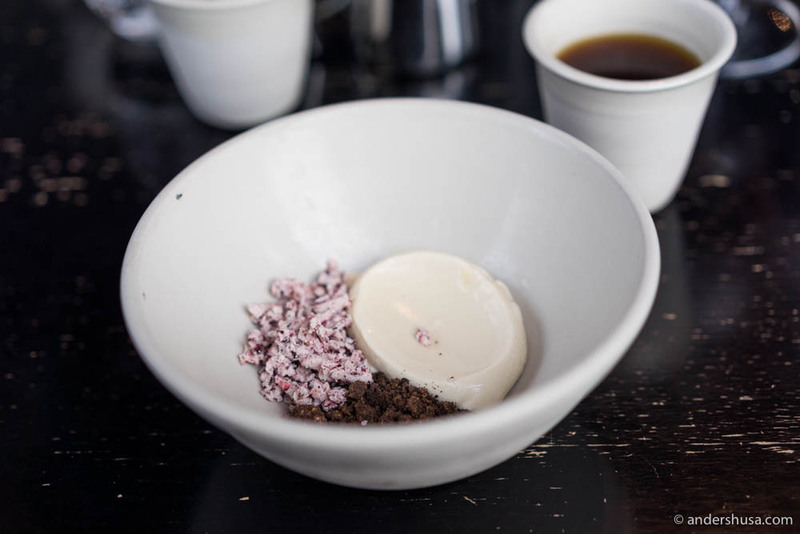 I wonder if I will ever be able to cover the entire food scene in Copenhagen. There are just so many great places in this city, that it feels unimaginable. My Copenhagen foodie map now contains 55 spots, and I haven’t even updated with the latest visits yet. Many people are under the impression that I focus a lot on fine dining restaurants. I don’t necessarily disagree, there certainly has been an extensive coverage of that genre, but I know that I visit more casual restaurants in total. 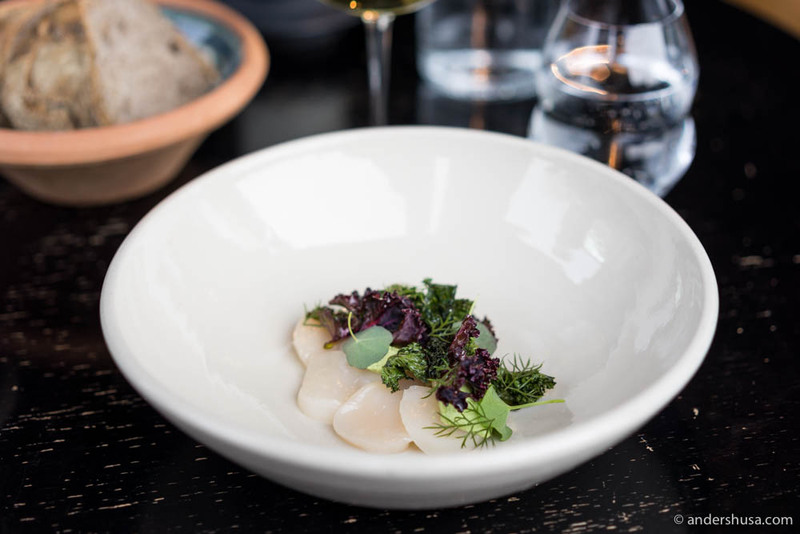 Previously this year, I did a round of the sister restaurants of well-known Michelin-starred places in Copenhagen. Pony by Kadeau and Trio by AOC was on that list, but also No. 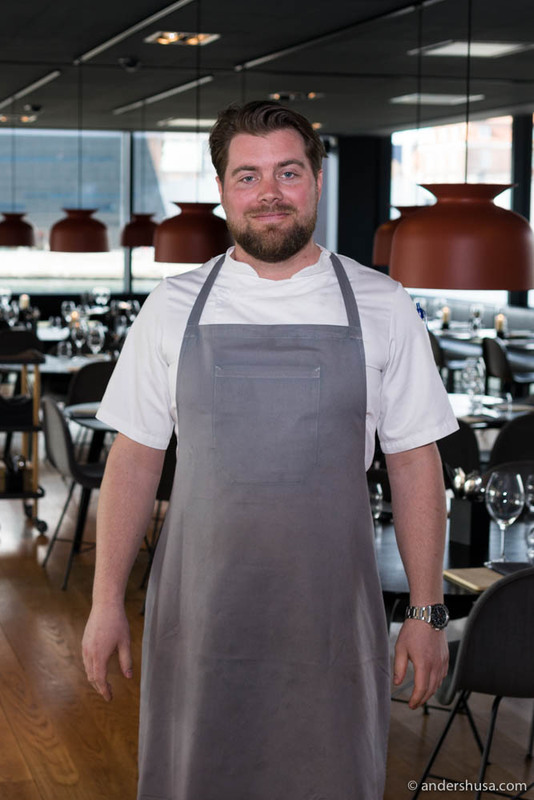 2 (or Nummer 2) – an informal Nordic brasserie and the other sister of the two-Michelin-starred restaurant AOC. 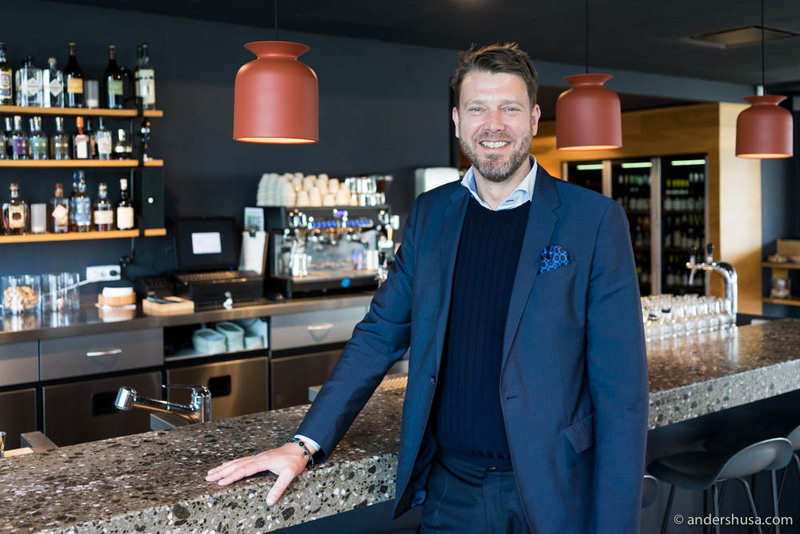 I met up with my good friend Rasmus Paslgård (aka Feinschmeckeren), for a business lunch between two foodie colleagues. Restaurant No. 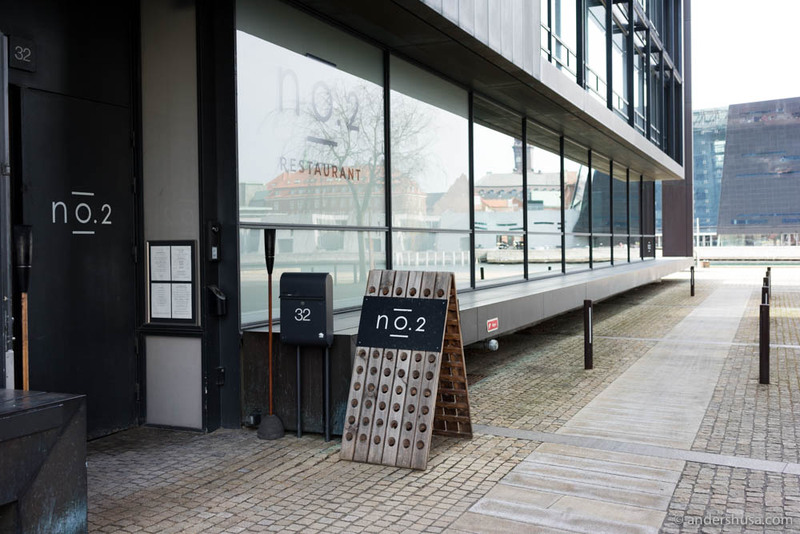 2 is located by the canals in Christianshavn, directly opposite of the Royal Library (aka the Black Diamond). 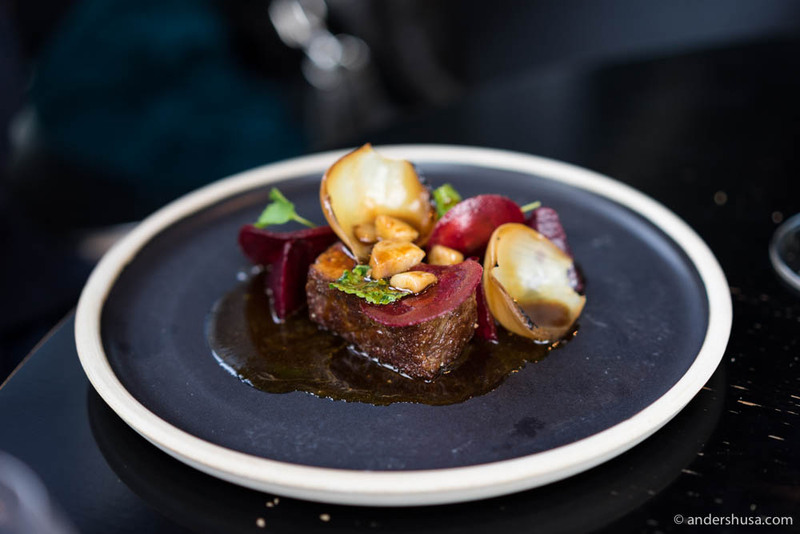 Where, by the way, I’ve previously checked out another great semi-casual restaurant – Søren K. However, please note that Casper Stuhr Sobczyk is no longer the head chef there, and thus, the food concept may have changed as a result. I arrived, slightly late, on a Copenhagen city bike (best way to get around town), from hotel SP34 where I was staying in the city center – crossing over Knippelsbroen. Mr. Palsgård was already waiting at the table. Hungry. Luckily the food arrived quickly after we decided to go for the four-course lunch menu (DKK 400). 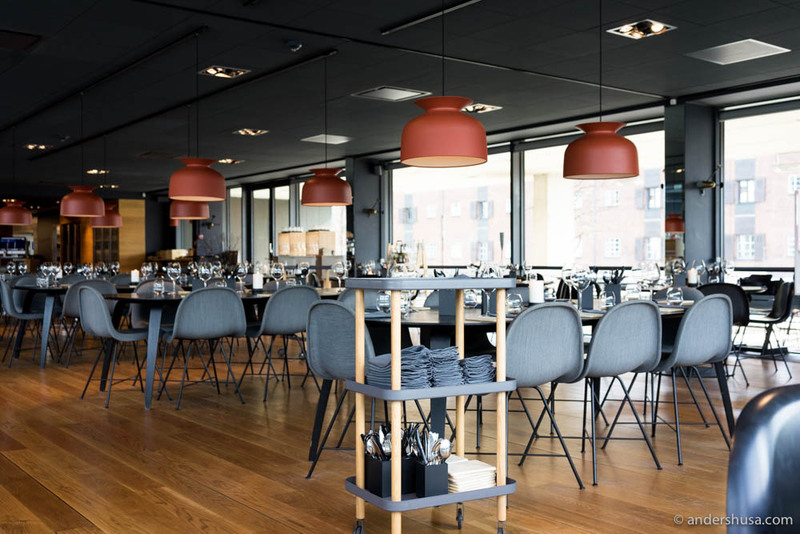 There is also a three-course (DKK 325) and two-course menu (DKK 250) to choose among unless you want to go à la carte (prices are DKK 90-200 per dish). 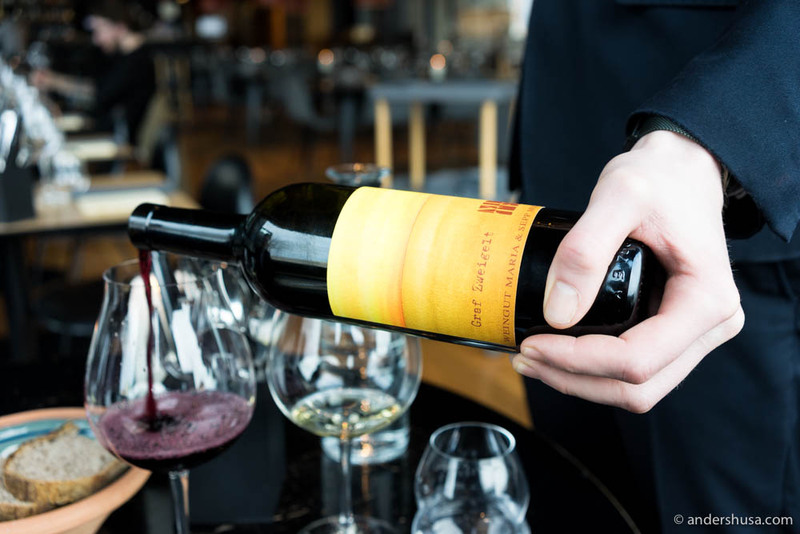 In the evening, you can make the same free selections, or have a six-course (DKK 475) or eight-course (650) tasting menu. Head chef Nicolaj Køster presented the first snack – a puck (not really snack-size!) 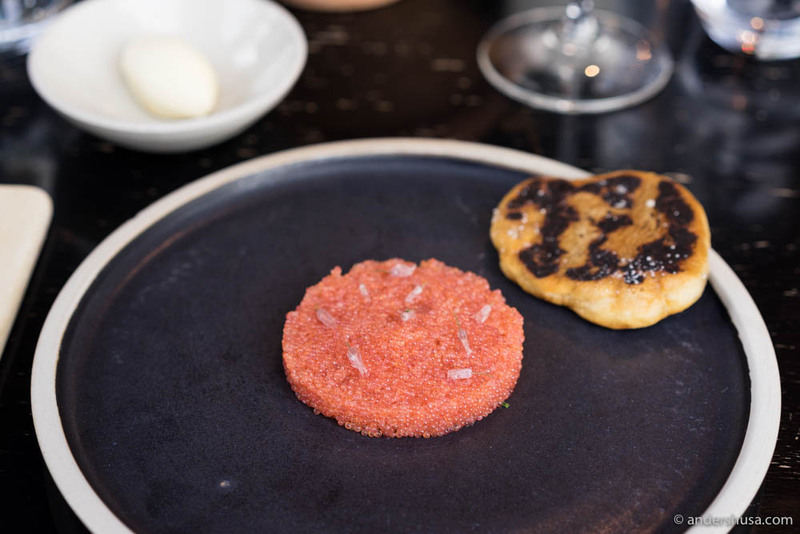 of lumpfish roe topped with pickled chive flowers, with a scoop of crème fraîche, and a piece of grilled and salted potato bread. Even Rasmus had noted the silly amount of lumpfish dishes I had eaten in Copenhagen during this trip. Clearly a popular seasonal product in the city of Kings, but who cares when it’s that good? This dish was no exception. I loved the grilled and salted potato flatbread to accompany the elegant fish roes. Following was another small plate of salted, raw scallops, violet cone cabbage, kale and buttermilk with horseradish. While tasty enough, it was not the most memorable dish we had. Dishes based around raw scallops are really tricky to perfect. Without cooking the clams, which, in my opinion, brings out the full sweetness and flavor complexity of them – all you are left with is the soft texture and very subtle flavor. To balance that with ingredients that compliments and enhances the marine mollusk is very hard. Unfortunately, this one fell short of extraordinary. My favorite dish at No. 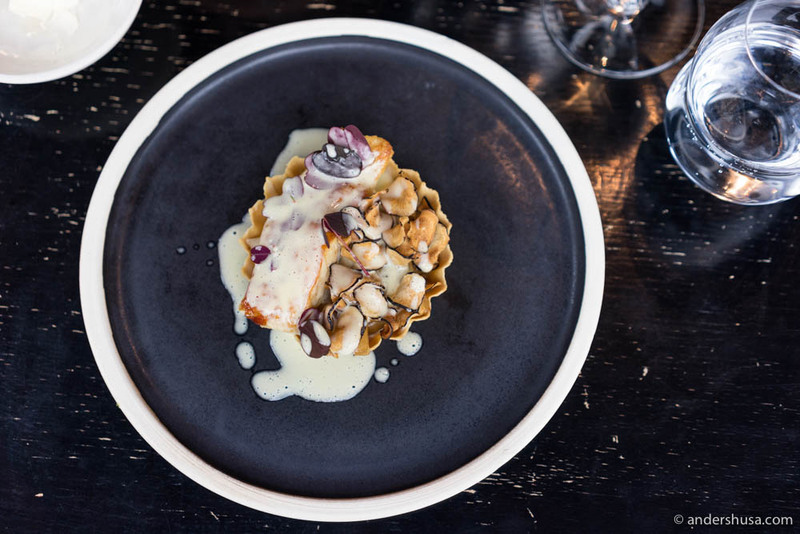 2 was a tart with pan-fried turbot, salsify chips, and a sauce of pickled fennel. The perfectly cooked fish, in combination with the salty and caramelized chips, as well as the rich and complex sauce that was poured over, was so satisfying. The sauce actually reminded me a bit of the fermented asparagus sauce that Maaemo has used for their scallop dish. That’s no small compliment. We ended the savory part with a prime rib accompanied by beetroots, and a sauce of smoked bone marrow & black pepper oil. In the glass came a red wine from one of my favorite Austrian winemakers – Weingut Maria & Sepp Muster. When the meat is this perfectly cooked and drizzled in bone marrow sauce, you really can’t complain, but I wish the beets would have been bigger, slow-cooked and meatier in texture instead of the thinly sliced and more anonymous kind. 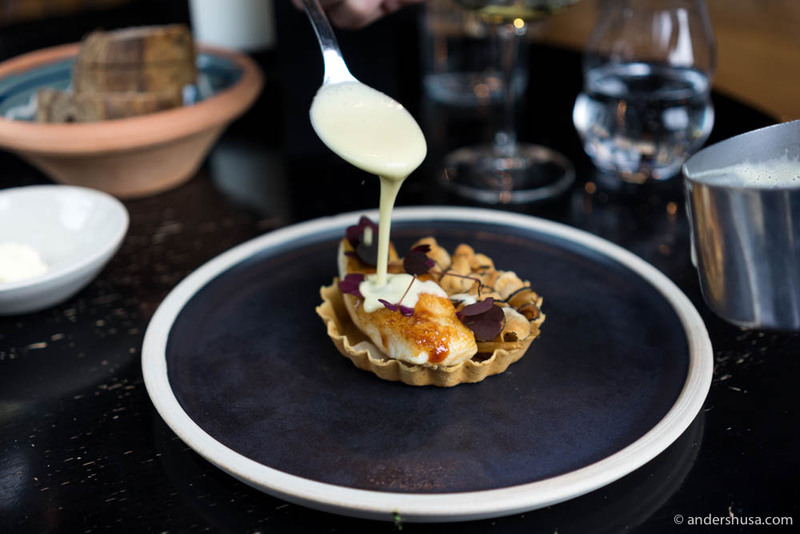 In either case, this one brought forth memories of a signature dish of the one-Michelin-starred restaurant Re-naa in Stavanger, Norway. My favorite dish from the lunch! To finish off this lovely casual lunch, was an ice cream on birch bark with salted caramel & chocolate crumble. How you infuse birch bark flavor into an ice cream is beyond me, but it tasted really good! Pairing a subtle-flavored, gently sweetened, creamy ice cream with salted caramel and chocolate crumble (mostly for the texture) is the way to sell me on the dessert side. 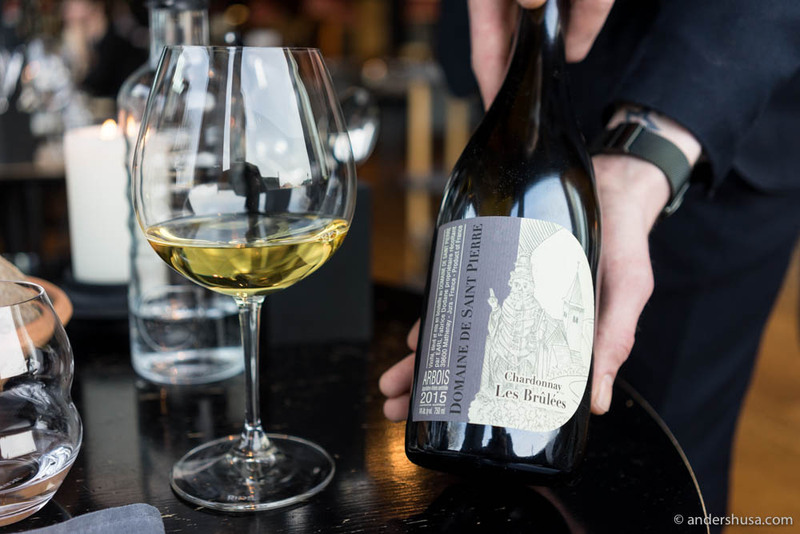 Which other casual gems in Copenhagen should I check out? Please leave your suggestions or wishes in a comment below.